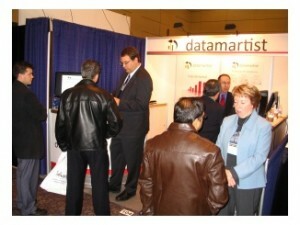 nModal Solutions was proud to present the Datamartist Beta at the financial technology show in Toronto on November 25. We met lots of interesting people, and their positive reaction to the ease of use and functionality of the tool was much appreciated after all the work done to get this far. As with many of our fellow exhibitors there, we had a big bowl of candy at the front of the booth. The idea was to draw people in for the candy, and then catch their eye with the video or with a brochure. But sometimes it worked too well- I'm sure that I saw some attendees come back 3-4 times for another handful. Shows like this are a great chance to talk to end users, and we got a chance to talk to people about what they were using for their source systems, and what kind of reporting or data analysis they had. Excel was the almost universal constant, and as expected the Excel export functionality in Datamartist almost always received a warm welcome. There were a lot of self-employed accountants in attendance, and the possibility of a solution that didn't require any servers, and didn't need any SQL programming skills seemed to go over pretty well with people on a tight budget. It was clear that the economic environment was on everyone's mind. 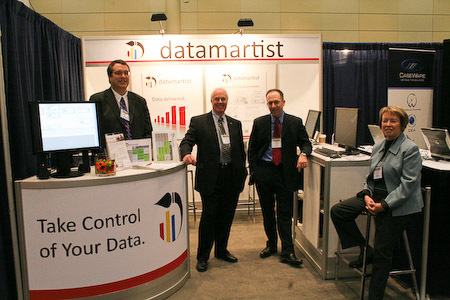 Some of the people most excited about what datamartist could do were those who confessed they'd dabbled in some database programming to try to get a handle on their data when they'd exhausted what Excel could do. They immediately understood how powerful the reference set functionality was, having seen themselves what was needed in a database environment to build dimensions. Our comparison of spreadsheets, Datamartist and databases made this clear, and you could see the light go on as users realised where Datamartist fit. One of things that many of the attendees expressed an interest in was to have pre-defined import blocks that took data directly from a specific application, and did pre-defined transformations to kick off their analysis- we're definitely putting that one on our list- we're certain our beta testers will have suggestions as to which application might be a good candidate for our first application import block. 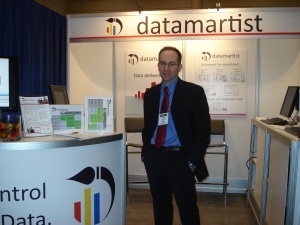 Now that the show is over, and the signs and candies are stored away, its back to the Beta, and I'm charged up after having a chance to talk to users with clear problems Datamartist can solve. I want to thank the whole trade show team for a great job- and a very successful show.